What beverage is more essential to music than beer? 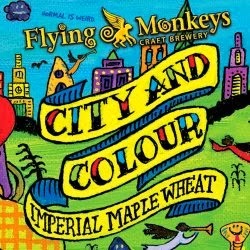 Recently, the Flying Monkeys brewery took this thought to heart when they collaborated with singer-songwriter Dallas Green of City and Colour to create the Imperial Maple Wheat Ale. This is the second release from the Treble Clef Series, so be sure to expect some more colla-brew-ations with more Canadian musical talent. The bottle is decorated in the typical Flying Monkey style: loud patterns. A lime green label is decorated with images of Dallas Green’s face, a yellow marquee, and cryptic lyrics scattered across the bottle. The beer itself is a nut brown ale, with an aroma of caramel and biscuit - almost like a Belgian waffle. The beer pours with minimal carbonation, and a thin golden head. The maple flavor dominates, adding a sweet, yet balanced finish to the rich malt. And although the flavor is smooth, the brew is 11.5% alcohol by volume and is meant to be shared with several of your friends. However, this beer needs to know its place. Not to say that it’s a bad beer by any means. It just doesn’t belong with your pizza or wings. This beer is sweet in a dessert-for-breakfast kind of way. It deserves to be sipped alongside a crème brulee. Or poured over your pancakes. Or turned into a delightful maple ale caramel. Also see my article in the Gateway Newspaper about this beer. 'Tis the season for caramel apples as well. As fantastic as caramel apples are without embellishment, they can't get any worse if I were to add my favorite flavor-boosting ingredient...beer, of course. Note: Be careful, young padawans. Hot caramel is dangerous! Don't dip your finger in, just because it looks delicious. It will BURN you, as it did me (second degree!). In a small saucepan bring 1 cup of the maple ale to a simmer and cook until reduced and syrupy (about 20 minutes). You should have about 1 tbsp of thick, syrupy, beer reduction at the end. Set aside. Combine all other ingredients except ale reduction in a large heavy pot. Cook over medium heat, stirring occasionally until the butter melts and the mixture boils. Continue to cook until candy thermometer reaches 244 degrees, this will take about 30 minutes. To test your caramel, drop a small amount into a bowl of ice water - if it forms a ball, the consistency is right. When the correct temperature has been reached, stir in the ale reduction and remove from heat. Dip apples into caramel and spin to coat. Place on wax paper. Let cool for several hours or place in fridge until firm. Makes about 10 caramel apples. Feel free to decorate your ale-pples – crushed peanuts and Reese’s Pieces are my top choices. One reminds me of carnivals, while the other of Halloween parties.